Originally uploaded by Southworth Sailor. Sometimes all you need is a slight variation to a common game to add a little excitement. On Wednesday evenings I help out with our church junior high youth group. 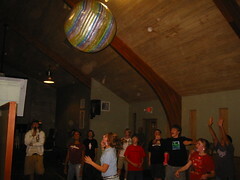 This week we played blind vball with an exceptionally large ball. The teams couldn't see eachother because of a makeshift wall, which added to the fun. We have been having a great turnout of about 45 kids each week. While I enjoy the evening of interaction with this high energy group, I'm thankful for my elementary classroom! Hats off to junior high teachers.